1 double bed and 2 single beds. 1 toilet and 1 shower. Week start day: Tuesday or Saturday. Short break start day: Tuesday or Saturday. Will not pass under any bridge except Acle at low tide. Cruising restricted to North of Great Yarmouth. 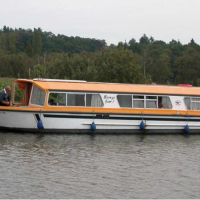 A small but spacious cruiser that would suit two couples or a small family, the Far Horizon is perfect for exploring the Broads at your own pace. Whether you’re intent on whiling away the hours spotting wildlife, reading, or just spending time with your nearest and dearest, the Far Horizon is the ideal vessel. New for 2012, the boat has warm air heating, a bow thruster for easy handling, and an elevated stateroom that allows you to fully enjoy the stunning Broads scenery.